Every year there are multiple fighting games released that are never brought overseas in any form. If the game doesn’t have a number behind it, chances are the title won’t be making its way to English shores unless people choose to import it. 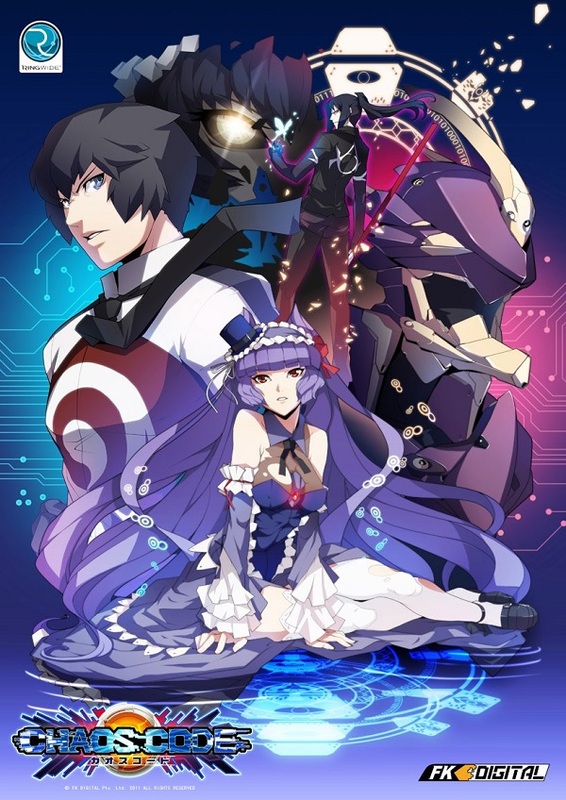 However in recent years a few different fighting games have slowly been released in English and now an anime styled fighting game called Chaos Code from little known developer FK Digital has been released onto the PSN. Does Chaos Code give us a taste of something different or should it have remained in the dark? Unfortunately, Chaos Code packs a very basic story mode that plays as a simple arcade mode. 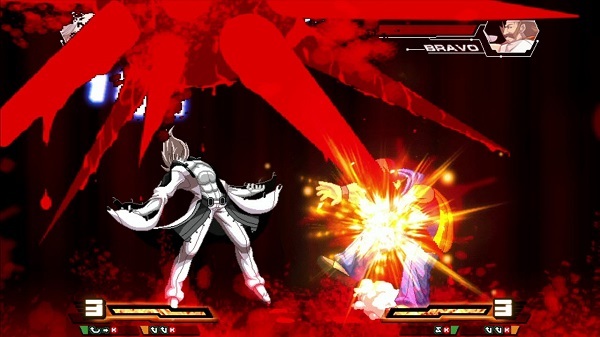 In this mode players will select a character from the fourteen available, see their initial reason for fighting and battle numerous enemies in a row. Once they reach the final two enemies there is a bit more dialogue and defeating these final bosses treats the player to that character specific ending. There is a bit of a twist available to players in the story mode however, as defeating opponents in a special way does open up a possible B ending that features different fights and a different ending for each of the characters. That being said, considering the game was in Japanese before this, it is worth noting that the only way to understand the story is to read the English subtitles when they are available, and unfortunately these subtitles are atrocious. There are numerous translation errors throughout each of the characters’ story mode, a number of which could easily have been caught if it was checked beforehand by a native English speaker. 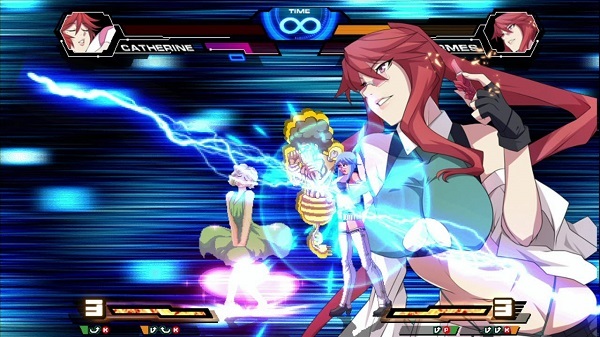 When players start up Chaos Code they will notice that there are only a few modes available for play. There is your standard story style arcade mode where players fight through a series of enemies to complete each characters story, a versus mode to fight against either the computer or in local multiplayer, a survival mode and finally a practice mode. There is also an option to see various ending scenes you’ve unlocked and other pieces of artwork from the game in a Gallery option. Once you enter the fighting modes, there are fourteen characters to choose from, though two do have unlockable “boss” variants that can be used in multiplayer only due to their overpowered nature. There are numerous fighting styles available amongst the fourteen available fighters and to add a bit more to the game, players are capable of selecting two of four special attacks to take into battle and even the ability to choose their movement type. These special moves can be anything from special dodges, long range blows, close range attacks or even some area of effect ones that can hit wherever you are. Each fighter has four different options to choose from so it gives players quite a bit of choice as they learn the intricacies of each of the fighters’ attack pattern and find which one works best for their playstyle. However that won’t be too difficult thanks to the fact that it is actually not all that hard to learn to play. Chaos Code is a four button fighter for the most part, meaning that there are strong and weak punches and strong and weak kicks and all of these buttons can be put into both ground and air combos which vary depending on the character and of course, grab moves. Special moves, such as the ones selectable on character select, are always shown below a special attack bar for easy reference and as for that special attack bar, it is filled up whenever the player deals or receives damage. The special meter adds a bit of depth to the game as there are numerous specials available to each fighter, which again isn’t overly complicated to pull off, that sap a certain amount of the bar. 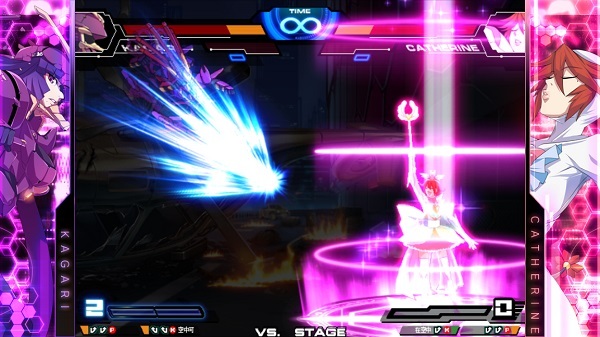 There are Tactical Guards and Guard Breaks that take a bit off the bar while special EX, Ultimate Chaos, Destruction Chaos and more variations are available for players to unleash if they manage to input the commands correctly. To add even more depth to the fighting, there is even a stun meter that will leave opponents temporarily dazed if hit too often in a short period of time, often leaving them vulnerable for one of the aforementioned Chaos attacks. You may have noticed that I have made no mention of an online mode for Chaos Code and that is because, at the moment at least, there is no online component to the title. FK Digital has said that they are currently working on bringing an online mode to the game but currently it is unavailable, meaning that the only way to actually fight against someone else is to play local co-op against a friend. This is a pretty big oversight for the title considering how well balanced most of the fighters in the game are, as it seems nearly every character has a chance against any other on the roster thanks to how detailed the combat system is. Everything in Chaos Code is bright and flashy once the player gets past the mundane menu system. Fights can be fast paced and each character comes with some fancy, over the top looking attacks that can take up the entire screen at times and even the characters themselves come in all shapes and sizes. 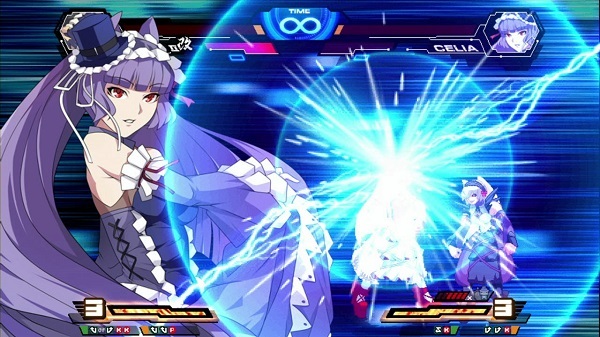 There are your typical fighting types but also ones such as Cait Sith, a pair of twin fighters and even Catherine whose special moves involve cosplaying in different outfits for damage. There is a bit of pixilation on each of the character sprites, but nothing too terrible thanks to the screen ratio. 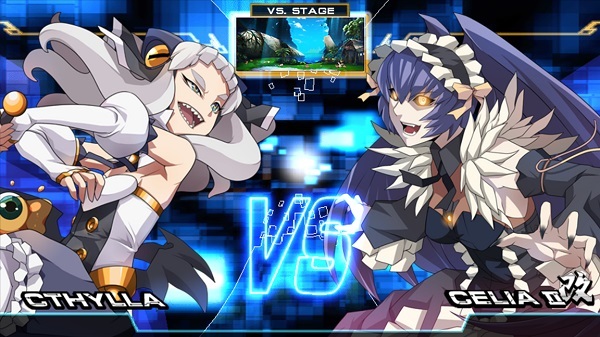 Since Chaos Code was originally released as an arcade title over in Japan, the ratio of the screen is a bit boxy; this is adverted for this widescreen release by placing each fighter’s character portrait on their respective side of the screen, a common but nice looking trait to anime style fighting games such as these. As for the stages themselves, they are varied well enough and just as brightly colored and random looking as the characters players can fight as. The game is presented with the original Japanese voice work intact and instead we get the aforementioned subtitles which, as mentioned earlier, are rife with translation issues and awkward sounding English. Anyways, the Japanese voices are suitable enough for the characters and the game sounds great in motion as they yell out various phrases as they attack their opponent, enter the fight, or celebrate a victory. Chaos Code’s soundtrack is very impressive as it offers a wide range of background music that fits the fighting game well. Every music track has a Japanese feel to it of course but it manages to fit the sometimes fast paced nature of the battles well enough to make each fight a bit more interesting because of this. Chaos Code is something of an anomaly in this day and age. While it may offer very little in the way of gameplay modes and suffers from pretty bad translation issues and occasional graphic mishaps, it also offers some fun and exciting combat with an intricate but easy to learn system that lets players customize their fighter a bit for their own style. While it does come at a rather discounted price, it is a shame that at the moment, there is little to do in the game besides face off against the AI or a friend on the couch as the lack of online is a serious issue.